How long do tires last on a Subaru Outback? Who makes the best all season tire? What size tires does a Subaru Outback use? The Subaru Outback is a monster when it comes to roaming unfriendly terrain. It has a symmetrical all-wheel-drive system which makes it one of the best all-terrain vehicles. But there comes a time when the tires need replacement. Especially when the ride gets noticeably rougher and noisier. If this is where you are, then you need tires that provide excellent handling, traction and ride quality. Plus a 50,000 mile and above tread wear warranty wouldn’t be too much to ask from the manufacturer. In this review, we take a look at some Subaru Outback tires that are worth your money. And, yes, it will involve looking into some of the big brands and seeing if they are making any efforts in giving us a decent tire. So read on. Product by Goodyear Tire and Rubber Company. A multinational tire manufacturing company based in Akron, Ohio. 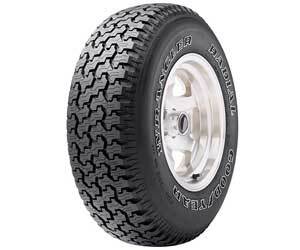 The Goodyear Wrangler Radial tire is a top rated all weather tire. Reason being that this tire has pleasant on and off-road performance. It has an optimized tread design that provides topnotch traction on mud, snow, wet surfaces and off-road terrain. The tire has a uniquely defined tread plan with deep cuts and sips that let water and mud run off. It also features large and even tread blocks around the shoulders for improved handling. Each edge in the tire is deep and wide to give the tire a large profile. A big footprint ensures the tire maintains stability even at high speeds. It also prevents large pebbles from getting trapped inside the treads. Despite the large makeup of the body, the tire doesn’t appear to be bulky. Instead, it’s smooth and frictionless which allows the Subaru Outback to gain enough speed and get to its destination on time. The tire can maintain speeds of up to 180Km/h and handle loads of up to 925 kg. Two steel belts strategically placed inside the tire enhances its strength and durability. Circumferential grooves running around the tire limits the risk of hydroplaning, enhances wet grip and improves performance on snow covered roads. A limited warranty backs the Goodyear Wrangler Radial Tire. This includes a free replacement for the first 2/32 inch of wear. The Goodyear Wrangler Radial Tire feel like the best replacement tires for worn out original Subaru Outback tires. The tire can take a hit from the roughest terrain and still show little signs of tread wear. Plus, it’s versatile in that it can be the tire for daily drives around town and you can still count on it to go to your favorite off-road camping site. Product by Hankook. A company specializing in making auto and truck parts based in Gangnam-gu, Seol, South Korea. The Hankook DynaPro is a strong and durable tire made with the toughest formula to resist wear. The tire features wraparound tread technology that extends to the sidewall and protruding rubber blocks. These features keep the tire grounded and balanced. The central tread grooves are wide and deep to prevent rocks from getting stuck between the tire and potentially puncturing it. A wide, zigzag tread pattern also allows snow, water, and mud to roll off the tires. It also gives the tire a rugged look. The lifespan of the tire is extended due to two-step sipes that reduce wear and improve the tire’s performance. What’s great about this tire is that it’s quiet on the road, unlike other all-terrain tires. Hankook has given this beast of a tire a rim protector for rim cushion to limit damage to the sidewall and the entire wheel. The rim protector also maintains tire separation in case the tire pressure becomes low. The Hankook DynaPro has a T speed rating that can maintain speeds of up to 190 km/h and a maximum load of 950 kg. What you can expect from the Hankook DynaPro is absolute control and stability. You have got to bow to how it handles deep snow and ice like a beast. Plus, the tire is the 8% wider than most all-weather tires in its category, and for that reason, it is more balanced. The ergonomic tread design also gives you much-needed grip and acceleration during on and off-road tours. Generally, the tire gives you value for your money and is recommended for anyone who isn’t an aggressive off-roader. Product by Falken. A brand owned by Sumitomo Rubber Industries which is a Japanese company that makes tires for passenger cars, medium, and light trucks. The Falken Wildpeak has a deep and well thought out tread design that makes it an all-terrain expert. 3D canyon interlocking technology goes into the making of the treads to give the tire high wear resistance from high torque. Deep treads allow for water and snow to run off. The Falken Wildpeak, therefore, shows great performance when riding over wet roads, snow, and even dry roads. The tire features heat diffuser technology which keeps the inner tire components protected from excessive heat. The lower sidewall dissipates the heat, and with the inner components being cool, the car can maintain its stability even during heavy towing. The tire also has an aggressive upper sidewall coupled with offset shoulder blocks. These two special features prevent sharp rocks from puncturing the tire and offer extra off-road traction in off-camber situations. The sidewall also has ridges that prevent rocks and hard chunks from eating at the tire. With a T speed rating, the tire remains quiet and shows smooth handling on the road. It can also hold a maximum load of 2679 lbs. 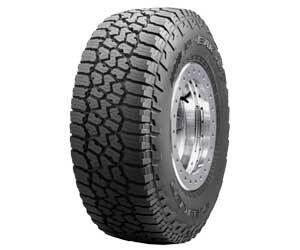 The Falken Wildpeak has unique features that have proven to be helpful for someone constantly driving in off-road conditions. First off the heat dissipating technology saves you maintenance costs when inner parts heat up and get damaged, more so when you are off-roading in hot weather. The tread pattern is also a winner with no pebbles, snow or mud chunks getting stuck on the tire. It’s a real beauty and a beast that will last you longer and give you a good time in your off-road adventures. Product by Kumho Tire Inc. A tire manufacturing company that’s a subsidiary of Kumho Asiana Group. It is based in Gwangju, South Korea. The Kumho Road Venture AT51 is great both on and off the road. It has excellent all-terrain capabilities and can handle snowy conditions. When Kumho launched this tire, they independently tried and tested it for snow performance. It may not be a special winter tire, but the mountain snowflake symbol on the tire says that it has excellent snow performance. The manufacturers equipped the tire with a deep central groove and an angled chamfer that drives snow away from the tire to provide the driver with adequate grip and acceleration in such conditions. The tire also features a dual silica compound that is built to withstand punctures, cuts and bruising. The design entails full-depth stepped circumferential grooves that help the tire maintain traction, especially on loose gravel. Tapered tread blocks also contribute to improved traction in deep snow, mud or slush. The ergonomic tread design is also paired with jointless bead bundles, a variable pitch tread block, and a two-ply polyester cord body. All these additional features work to reduce road noise, especially on rugged terrain. Dual steel belts paired with spirally wrapped nylon are fitted inside the tire to improve its strength and durability. The tire also maintains sufficient grip on almost all surfaces, and that makes the Kumho tire perfect for light off-roading. It is also above average in its class when it comes to maneuvering over dry roads, and at the same time, this Kumho tire is quiet on the road. The Kumho Road Venture AT51 is quieter and safer than most off-road tires. It also soaks in the pressure from bumps and gives you a peaceful off-road drive. You will also be satisfied with the tire’s ability to resist wear and punctures. 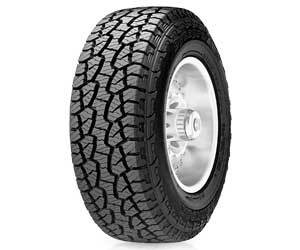 It is the best tire for people living in the harsh snowy area and hilly/rocky places. Product by Toyo Tires Holdings of America INC. A manufacturer and distributor of Toyo tires based in Cypress, California. The Toyo Open Country is an aggressive tire that minimizes road noise and improves your overall driving experience. The tire comes with deep tread grooves that improve traction in deep snow and mud. It also features an aggressive sidewall that gives the tire a tough body to prevent punctures and cuts. An open tread block design gives this tire the ability to ride over mud, dirt, and snow with ease and further reduce road noise. The tire utilizes a wear-resistant tread compound to ensure that it maintains its rugged look for years and save you tire replacement costs. The tire can stand the most rugged terrain and harsh driving seasons without being subjected to wear or punctures. Stone ejecting blocks prevent stones from getting lodged in the treads. You will, therefore, have a smooth ride even on gravel pavements as the stones are forced from the groves. The tire also features polygonal blocks and sipes that act as additional biting edges for grip to improve the driving experience in snow. Tie bars fitted between the blocks help keep the tread blocks stable especially when braking on dry roads. The tie bars also add on to the tire’s wear resistance properties. There is no way you can hide your satisfaction with the Toyo Open Country tire. The tire has graced the industry with driving comfort, excellent performance, and a good look. Plus there is no noise from these tires. No hum, no buzz just absolute quiet and peace of mind when driving. Even after 5,000 miles, the tires still look as good as new, and that’s a more than sufficient reason to buy them. It largely depends on how you use the tires, that is, your driving habits and terrain conditions. If you are more into heavy towing and blasting through rough roads, then you will get about four years of the tires. Plus, if you travel more miles than an average Subaru driver would in a year, say, more than 3,000 miles, then chances are the tires are going to wear out. But if you only go to work, store, and back, then you may get about ten years from your tires. Yes, that is if you live in or drive through deep snow areas. It’s prudent to get a tire that can handle deep snow and you will at least avoid hiring a tow vehicle every time you are trapped in the snow. Goodyear is often rated as a top all season tire manufacturer. We hope that our list was all that you needed and more in selecting the best tires for your Subaru Outback. If being on a budget is a deciding factor for you, then don’t sweat because these are some of the best tires that can be acquired at affordable prices. However, keep in mind that the best tire for you will depend on your driving needs and the weather in your area. The main point is to keep your Subaru Outback in good condition and safe for all weather driving.